Welcome back to our blog page here at Benjamin Brothers! In some of our previous blogs, we discussed common issues that your HVAC unit may face and how to properly deal with those. Living in sunny and humid Florida, you definitely want to make sure that your HVAC unit is working properly and efficiently. The last thing you need when August rolls around is to realize that your home’s cooling system isn’t up to scratch. But no matter when you’re needing the repairs, our HVAC service professionals are standing by, waiting for your call. We want nothing more than to get your system back up and running the way that it should. A system that isn’t doing what it should can cause you a major headache. For instance, certain issues in your HVAC, like leaks or frozen coils, can actually lead to bigger and more expensive repairs. Problems in your unit can also affect the air quality in your home; if you or anyone in your family struggle with dust allergies, your unit’s functionality can have a direct hand in the severity of those allergies. Finally, when your HVAC unit is in need of repairs or maintenance, you may notice that you’re starting to pay higher utility bills which can cost you so much more in the long run than the cost of regular maintenance. 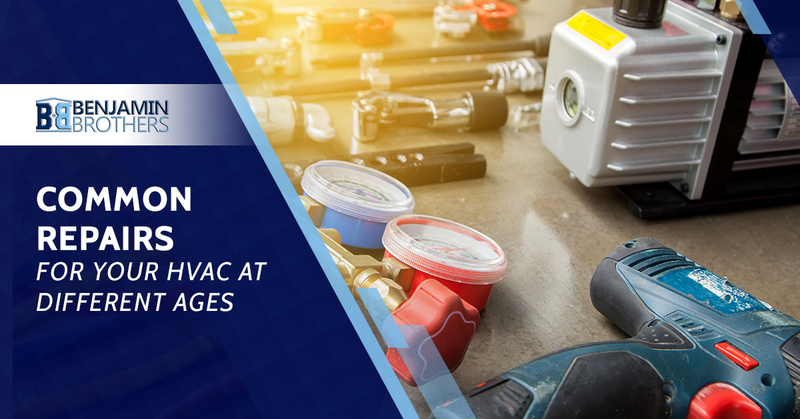 In today’s blog, we’re going to discuss some of the most common needs for HVAC repair at different stages of your unit’s life. Since your standard HVAC system is supposed to last fifteen to twenty years, you may notice a need for repairs as early a few years in. But even if you’re not seeing obvious issues with your unit, we can’t stress enough the need for regular maintenance and service calls. Continue reading below to learn more about what you might expect at different ages of your HVAC unit. A unit that is five years old is still considered relatively young; that being said, it’s not uncommon to start needing basic repairs on a unit that is so new. Though we’d never advise this, many people avoid their yearly HVAC inspections and by the time we take a look at their five-year-old unit, the obvious lack of maintenance has caused a slew of more expensive issues. Common things that we see occurring in a unit of this age is a dirty or clogged filter, which can lead to leaks and frozen coils, and low refrigerant. Make sure that you’re calling your HVAC service pro to schedule your yearly inspection. By the age of ten, your unit has been through a lot; It’s been doing its job faithfully and if you’ve been scheduling regular maintenance with your service pro, your unit has probably done well. But at ten years, your HVAC is definitely starting to show signs of wear. Common problems to see at this stage are broken fans, refrigerant leaks, accumulations of dust, and broken coils. If your unit is this old, make sure that you’re treating it well and scheduling regular service calls. By the time your unit is this old, you should consider yourself lucky if it’s been fully functional and in working order for its whole life. Common problems that you might start to see when your unit is this old can be quite extensive. If the cost of repairs is more than $3000, it’s probably time to go shopping for a new unit because installing new will be more cost effective and will save you so much more in the long run. If your unit is two decades old, it’s definitely living on borrowed time. Pay close attention to how it is running, what the airflow and air quality in your home is like, and what your utility bills are looking like each month. Also, it’s a great idea to start saving for that new unit; chances are, you’re going to need that savings quite soon. There are all kinds of reasons to need an HVAC repair professional. No matter what age your unit is, regular maintenance is the best way to ensure that your cooling system has a long and productive life. If it’s time to schedule your yearly inspection, or if you think your unit might need some repairs, give us a call at Benjamin Brothers. We proudly serve Hillsborough and Pasco Counties and the surrounding area. We’d love to work with you! Contact us today for a free quote.